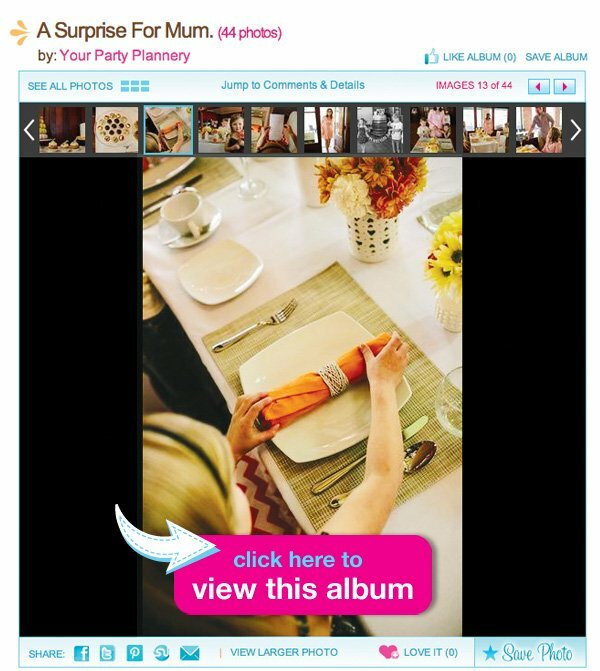 Home/Posts/Party Inspiration/Holidays/Mother's Day/Mother’s Day Brunch Surprise! Wow! 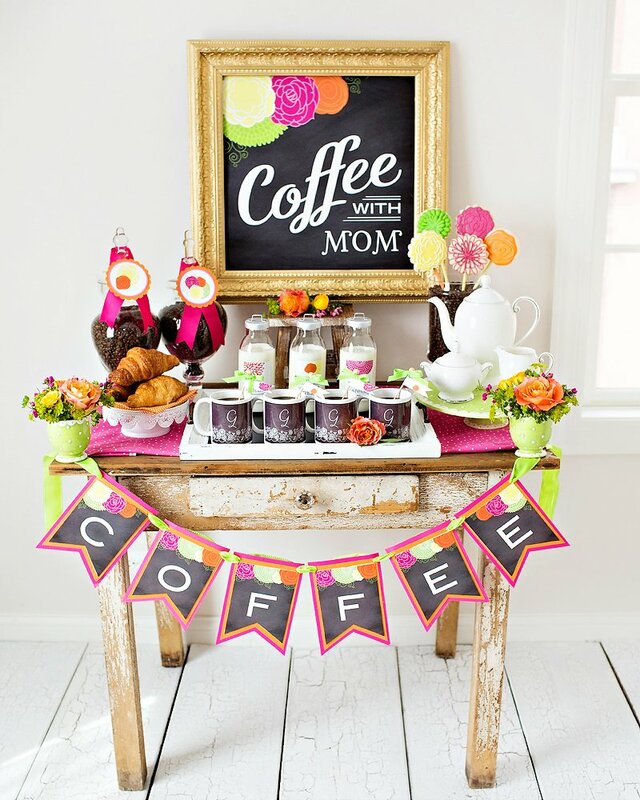 Nicole Bailey of Your Party Plannery dreamed up a beautiful Mother’s Day Brunch Surprise! 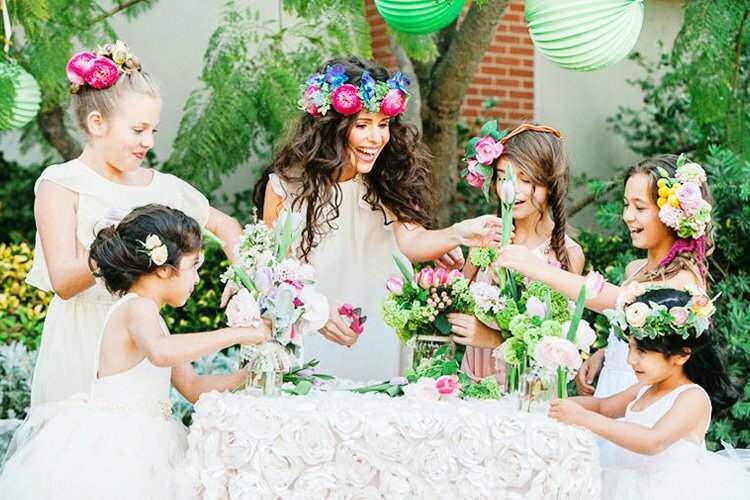 This is such a fun way for the kids to help celebrate mom- setting a brunch table and surprising her in a way she will love… flowers, champagne and her kids of course! 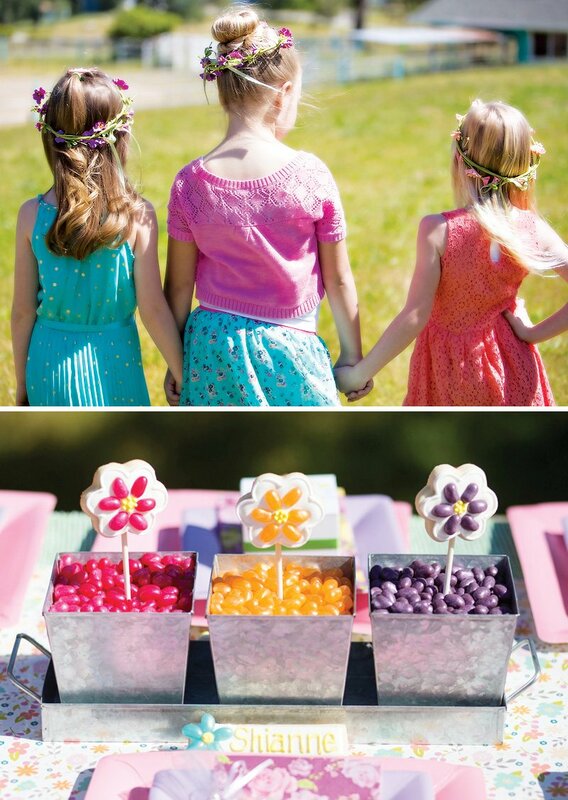 The theme of this shoot is Mother’s Day and surprising mum for her special day. Mother’s Day is May the 12th here in Australia. 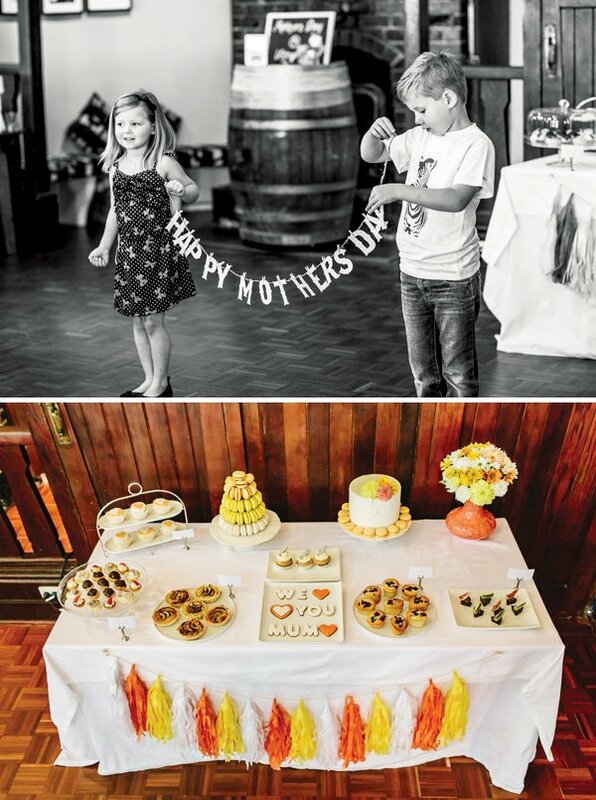 I also wanted to focus on things that mum’s love, that being; deserts, champagne, flowers, colours that are on trend for Autumn (its Autumn here in Australia) and her family thinking about all of these details while planning her a surprise. I wanted to keep the table setting simple but modern due to the stunning room that this setting was in and my colour palatte. Utopia Waterfall Gully is a historic restaurant celebrating its 100 year anniversary this year, and its historic features creates a tranquil, relaxing atmosphere. 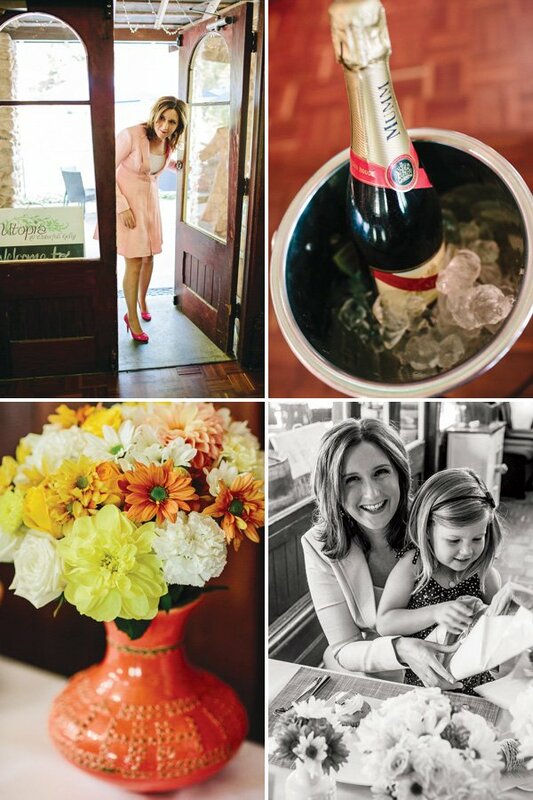 I was lucky enough to be able to use this setting to create my mother’s day surprise. The colour palette that I chose was; oranges, yellows and whites, which I used for my base colours. I also added in a few other colours into the desert table just to break up the tone slightly(chocolate and green). The colour palatte came about when I was searching for props online and found the most stunning Tangerine Chevron cushions, but after many many email’s I was unable to secure them in time for the shoot. This left me with my only option which was to have them made by local small business Little Luna. How lucky was I when she found the exact colour fabric and then whipped them up in no time at all. With the clothing I wanted to keep the colours simple and light. The mother’s outfit was a soft pink jacket dress from Datiro Designs, Swarkovski ear rings in orange, white and pink and I teamed that with hot pink heels from Regina Sole Queen. I then chose a Moulin Rouge themed dress from Brae and Leeli for her daughter in black and hot pink with cute black ballet flats. The dad wore a Ben Sherman shirt from Peter Shearer Men’s wear with deep reds and the son wore a cute zebra print tshirt also from Brae and Leeli. 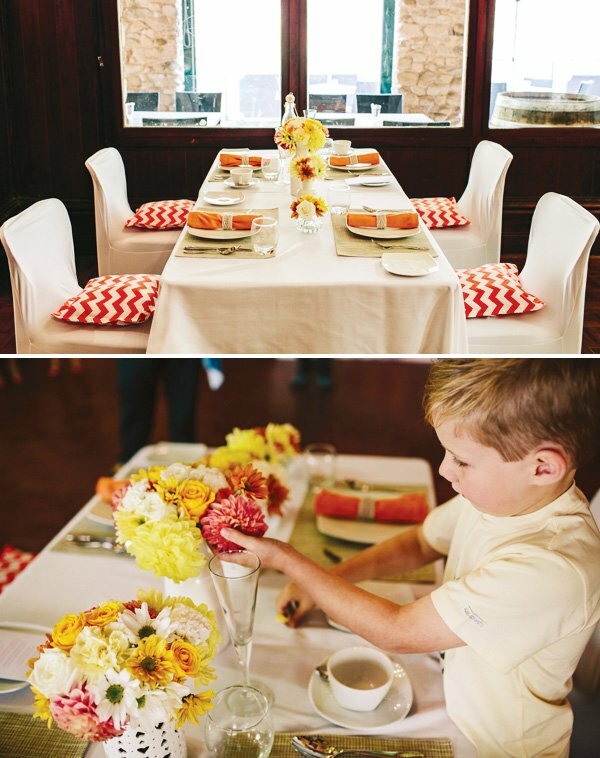 The dining table was set off by the stunning tangerine chevron cushions by Little Luna, on each chair. 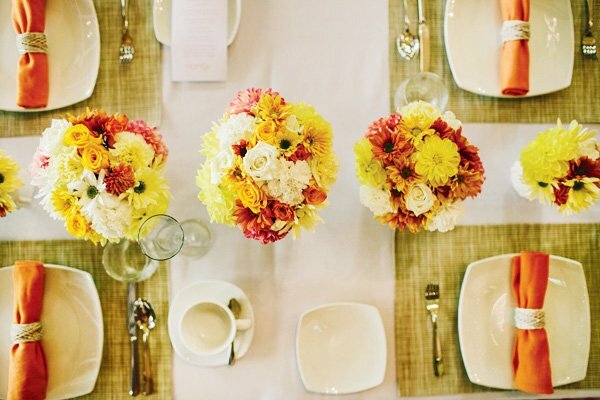 Then the beautiful coral napkins by Wheel and Barrow and stunning floral arrangements by Bella in bloom, really helped to make this an autumn pop of colour. 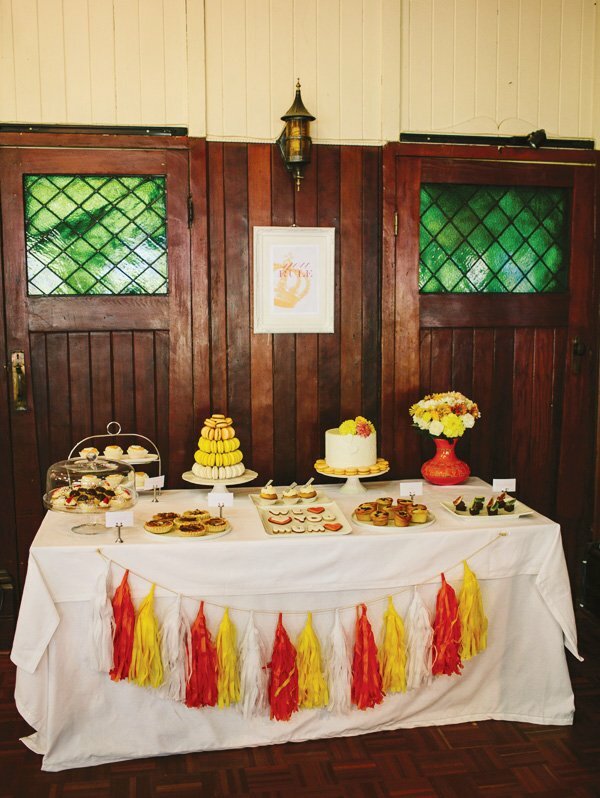 The desert table feature was set up against the beautiful heritage doors in Utopia Waterfall Gully. 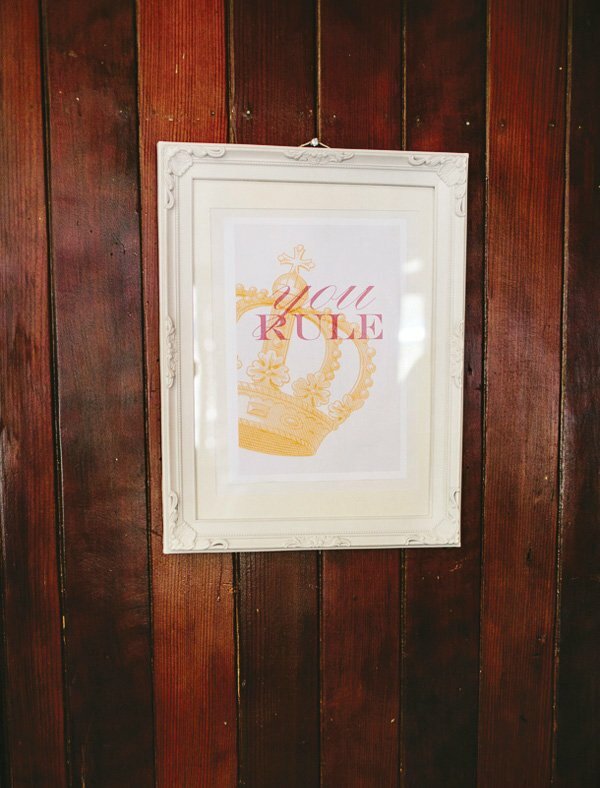 I wanted to put something behind this setting, so used the ‘You Rule’ print from Akimbo, which just says it all really! 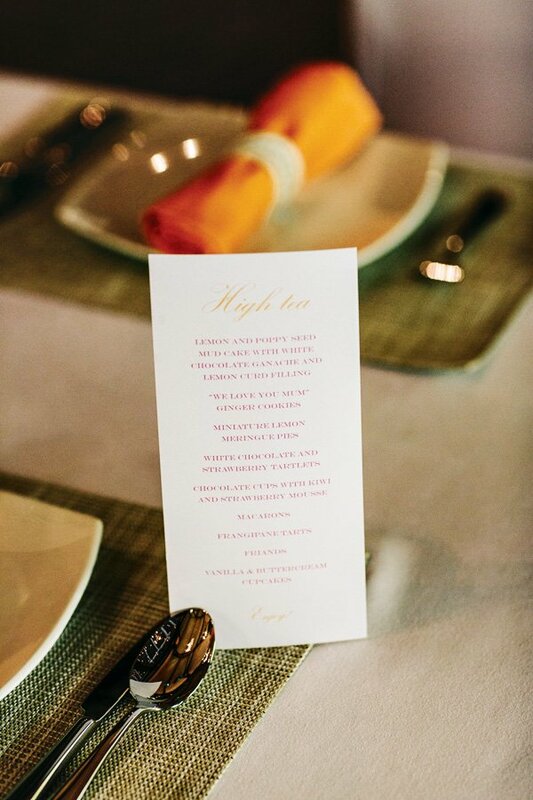 Akimbo also provided me with the High Tea menu, and the menu place cards. On the desert table I used platters, stands and linens from Wheel and Barrow. 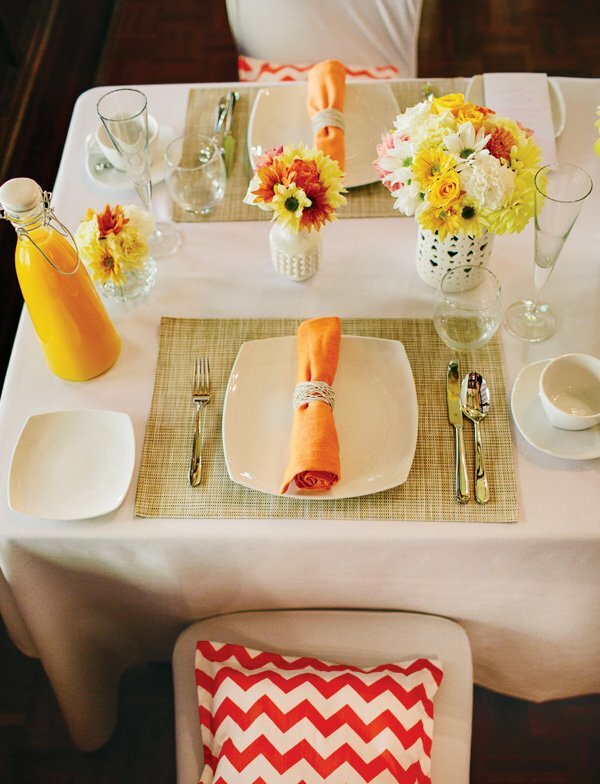 The bright orange vase was from Fireflies, this is where all of the vases in the scene came from. The flowers were also by Bella in Bloom. 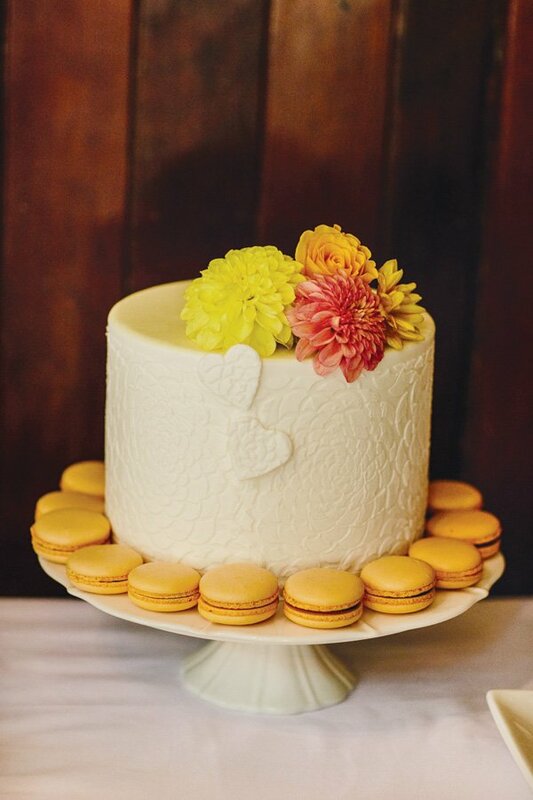 – The centepiece large white cake with love heart detail, was lemon and poppy sed mud cake with white chocolate ganache and lemon curd filling. It was by Sweet Treats Cakes and Cupakes. – The mini macaron stand was by The Almond Tree. 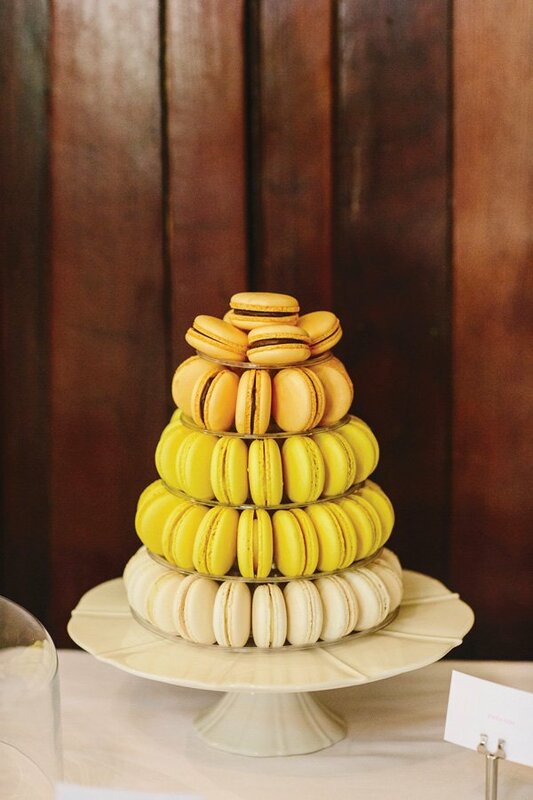 We had white chocolate, lemon curd and jaffa macarons. The Almond Tree was also responsible for the Frangipane Tarts and the blueberry friands. 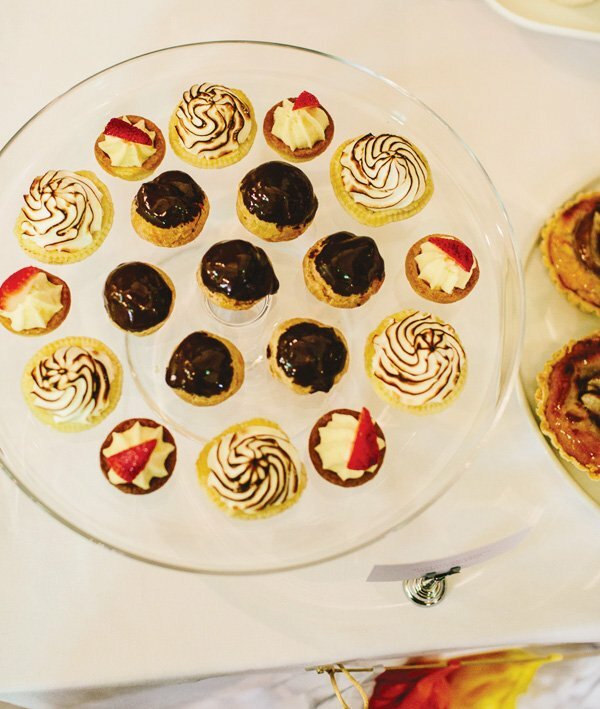 – The mini lemon meringue pies, white chocolate and strawberry tartlets and chocolate cups with kiwi, fig and strawberry mousse was also from Utopia Waterfall Gully. – The vanilla cupcakes with white and orange heart detail were by Sweet Sensation Cupcakes. 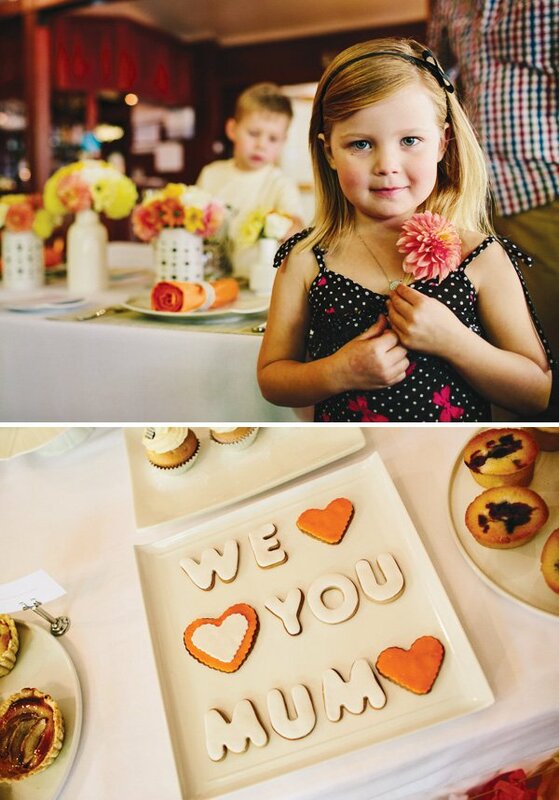 – The ‘We Love You Mum” cookies were by Cupcake Crumbz. 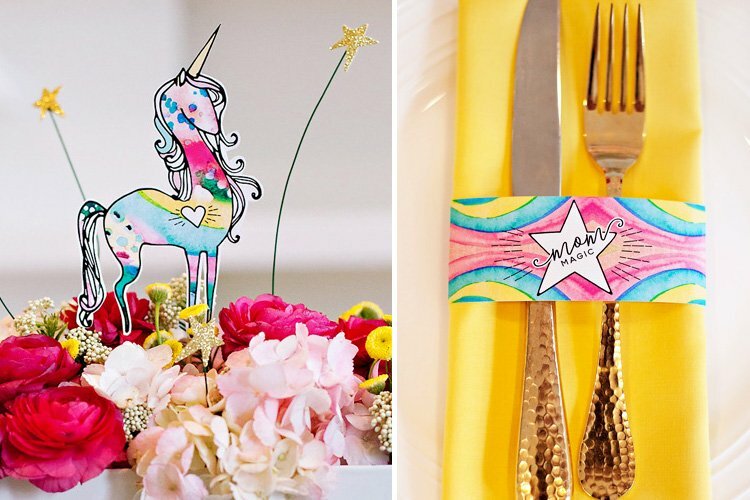 – I also used a coral, yellow and white tassel garland to pull all of this together, which was featured on the front of the desert table. This was by Blush Loves Mint and was simply divine in its colouring. 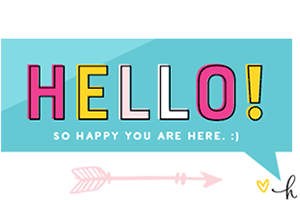 The “Happy Mother’s Day” banner was by Hot Sugar Designs. 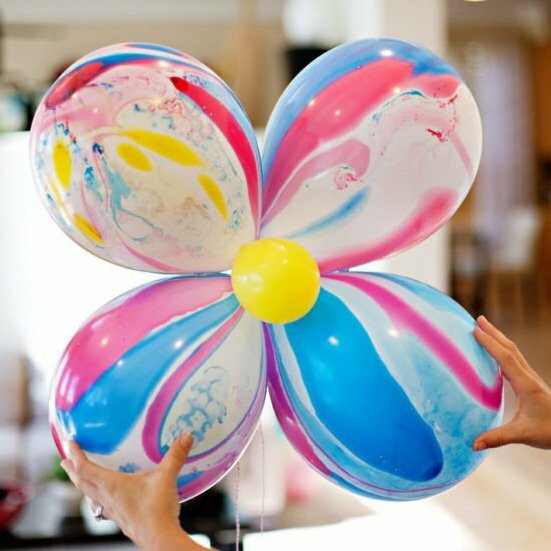 So beautiful, especially the colours! I am a sucker for tangerine! What a wonderful setting with such a great colour palate. 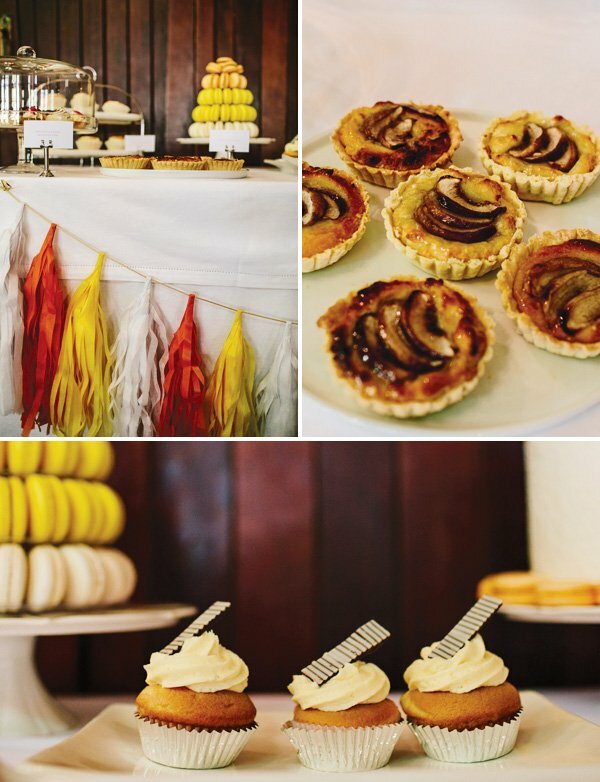 Great warmth for autumn and amazing looking cakes, flowers and decorations. Well done Nicole!